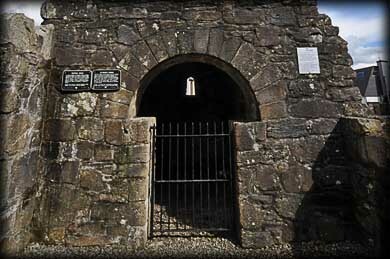 Located next to the Catholic Church in Killaloe is St Lua's Oratory. The small church originally stood on Friar's Island in the River Shannon. The Island was flooded and submerged during the Shannon Hydroelectric scheme in 1929. The Church was dismantled and rebuilt here in Killaloe in 1930. The now roofless Nave has a fabulous cyclopean doorway and is the oldest part of the church. 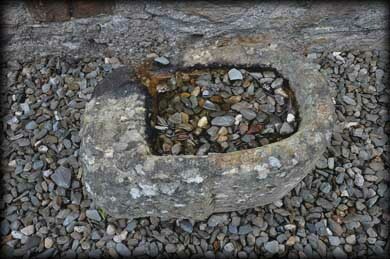 It dates to the 10th/11th century and may have had a wooden roof. The Chancel with it high pitched stone roof was added in the 12th century. St. Lua (aka Molua, Lughaidh, Luanus, Lugid) There were a number of Irish Saints named Molua, at least 37, so it is quite difficult to sift through the facts. But we do know that he founded a church in Killaloe and was very popular in the area. Molua comes from the Irish word Mo meaning My. He was so popular people called him my Lua which became Molua. 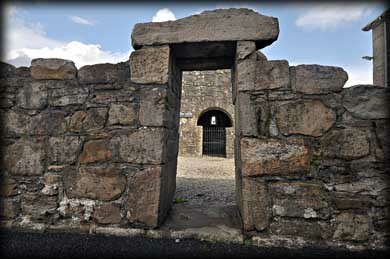 Killaloe also derived its name from the Saint, Killaloe - Church of Lua. 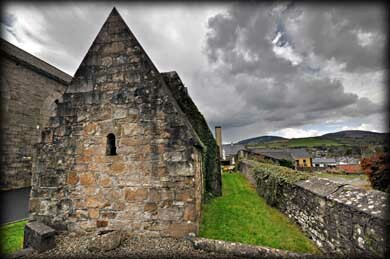 His nephew St Flannan is also associated with the area, St Flannan's Cathedral in Killaloe commemorates him. St Lua was trained under St Comgall in Bangor County Down before moving on to found many monastic sites through out Ireland. These included the renowned monastery at Clonfertmulloe in County Laois and his first foundation at Drumsnat in County Monaghan. Situated: Very Easy, in the centre of Killaloe in the grounds of the Catholic Church. Discovery Map 57: R 7000 7296. Last visit April 2012.